If you’ve ever been to a North Indian restaurant, you’re probably familiar with menu staples like chana masala, aloo gobi, and palak paneer. But at Munch India in Berkeley, I was intrigued to find a short list of dishes, most of which I’d never heard of. Kali mirch jhinga? Baigan chakri bharan? Diana Afroza, executive chef of Munch India, said many of the Indian regional selections at her restaurant on Shattuck Avenue reflect her family and upbringing. “[There are] a lot of things that my mom and my mother in law, my grandmother ... have taught me, and I’ve grown up eating. ... But I have never seen them in restaurants,” she said. “We want to do as much as possible to expose people to all these things that I have been learning and eating for years.” Afroza co-owns the restaurant with her husband and sous chef, Nick Ahmed. Although Munch India serves plenty of Bengali dishes — Ahmed’s family is from Kolkata, while Afroza’s is from both Kolkata and Bangladesh — the menu, which rotates every two weeks, will also include dishes from Delhi, Goa, Hyderabad, Tamil Nadu, Lucknow, Mumbai, and more. The couple’s mission is to introduce East Bay diners to the regional cuisines of India, Pakistan, and Bangladesh. In 2011, they launched the Munch India food truck, bringing the diverse regional cuisines of India to diverse regions of the Bay Area. And last November, they opened a brick-and-mortar restaurant at 3015 Shattuck. At both the food truck and the restaurant, Afroza and Ahmed draw inspiration for their menu from fresh produce and meat from Berkeley Bowl and local farmers markets, plus seafood from local purveyors like Tokyo Fish Market and Monterey Fish Market. Walking into the restaurant, you can see Afroza and Ahmed cooking in the open kitchen, where glass jars of spices, ground fresh in small quantities, line the counter. The heat of chili peppers singes the air. “We take our spices very seriously,” Afroza said. The toasted spices shiner in a cold salad of potatoes, tomatoes, and white peas, similar to chickpeas, tossed with tamarind, black salt, and cilantro. Afroza said this is a Bengali version of a snack she grew up eating. The white peas had a pleasantly firm bite to them, while soft chunks of potato and juicy tomato added contrasting textures. The sweetness of the tamarind sauce, meanwhile, was tamed by the flavor of the black salt and toasted spices. The balance of flavors and textures made for a refreshing, palate-cleansing opening to the meal. An eggplant entrée, meanwhile, delivered familiar flavors in a unique, elegant presentation. 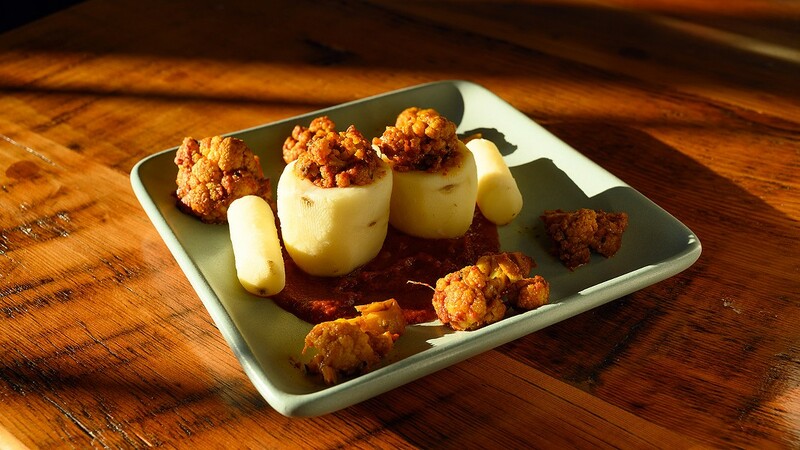 Afroza created this dish by combining baingan bharta, the dish of puréed roasted eggplant found in many Indian restaurants, and wrapping it in thin slices of pan-fried eggplant to create a roulade. “It’s all Indian, but we present it in a different way,” Afroza said. The contrast in textures showcased not only the versatility of eggplant but also the skill of the chefs. The al dente texture of the fried eggplant combined with the smooth, lightly spiced pureé made the vegetarian dish as satisfying as any meat dish. Lamb is common on the menus of many North Indian restaurants, and while there was no lamb on the menu during my first visit, on a return visit I tried the chef’s special: roasted leg of lamb, sliced and served with potatoes. Afroza said this is a Delhi-style dish, made by marinating lamb overnight with cinnamon sticks and garlic cloves. The leg is slow-roasted for nearly three hours, then sliced and pan-fried just before serving. The prep time paid off; the lamb was juicy and tender, and the spices highlighted the aromatic flavor of the meat. The murgh Hakka noodles, Afroza said, are a dish originally created by the Hakka Chinese community in Kolkata — the community that eventually gave rise to Indo-Chinese cuisine. The chewy, thick lo mein-style noodles were accompanied by chicken, carrots, caramelized onions, and, best of all, the crunchy wood ear mushrooms often found in Chinese cooking. You won’t find many Indian restaurants in the Bay Area with a wok in the kitchen, Ahmed said. But the wok gave the noodles a sought-after smoky flavor that can only be achieved by using a searingly hot, well-seasoned wok. A fried shrimp appetizer also took on Chinese influences, albeit more subtly. Here, battered shrimp were served with black pepper, green onions, fried garlic, red pepper flakes, and a sprinkling of Maldon salt. The shrimp were sweet and succulent, while the garlic and flaked salt added pleasant crunch. It reminded me of the salt and pepper shrimp you’d find at a Cantonese restaurant, with the addition of cumin seeds for a distinctly Indian flavor. And why shouldn’t an Indian restaurant be able to incorporate Japanese ingredients? 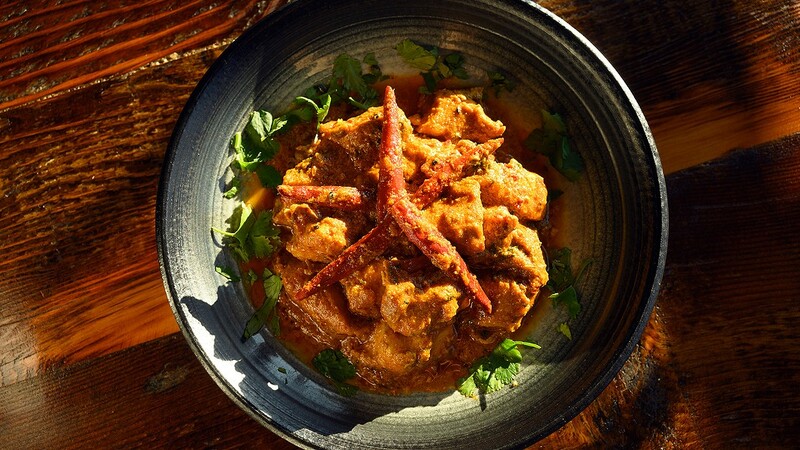 Culinary traditions are constantly changing, and Indian food is no exception. “Learning, knowing what the history of Indian food is, is very important,” Afroza said. “The food that we eat today is not [the same as] 6,000 years ago.” As Afroza noted, even the history of tomatoes and red chili peppers in Indian cuisine is relatively short. Maybe it’s time for yuzu to make its entrance, too. Since Munch India’s menu changes every two weeks, chances are the sea bass tikka won’t be on the menu, nor will any of the other dishes I tried. Still, there’s bound to be something you can’t find at most Indian restaurants, thanks to Afroza and Ahmed’s love for cooking and learning about new dishes. Hours: Tues.-Sat. 5:30 p.m.-9:30 p.m.